Homeowners don’t usually consider dumpster rental as part of their daily lives. However, there are times when you have a lot of stuff you want or need to throw away, but they don’t fit into your weekly curbside pick up from Rays Trash or Republic Services. When that happens, the best option is to rent a dumpster! 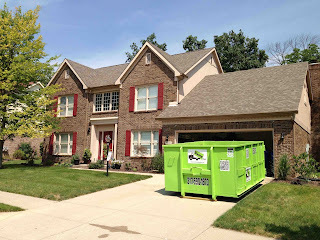 By getting a same day dumpster rental delivery, Bin There Dump That - Indianapolis will bring the dumpster to your home anywhere in the greater Indianapolis area. Whether its Carmel, Fishers, Greenwood or Avon, the family owned and operated business of Bin There Dump That serves all corners of Indianapolis. Check out our service area Map to see all the Indiana cities we service! Below are just some of the reasons why you may need to rent a dumpster. Take a look at these five ideas and consider if any of these are in your future plans. If you are working on a home renovation project, then you need a dumpster rental. DIY projects or a home construction remodels produce a huge amount of scrap materials and junk. This is something that you can’t avoid even when renovating your home or investment property. You will find yourself with scrap tiles, old fixtures, misc debris, lumber, and drywall at the completion of the project. There is no better or quicker way to dispose of this then having a dumpster on your job site! One of the most common reasons why homeowners in the greater Indianapolis area rent a dumpster is to make enough room for a garage cleanout. If you have accumulated a lot of stuff inside your garage and there’s barely room to park your car, then you will need to get rid of the excess junk just laying around. A dumpster rental is the most convenient and affordable way to get rid of all the junk in your garage and make room to once again park your car indoors. We wrote a specific blog on this a while back if you'd like to learn more on our garage clean outs! Holding a party is fun, especially during the holiday season but it also involves lots of trash. It might be a family event, block party or anniversary celebration. No matter what the occasion might be, part of the planning involves cleaning and organizing before the party then how to get rid of the waste after the party. A small dumpster such a 6-yard bin may be the perfect size to accommodate your party disposal needs. Part of moving out is to get rid of the unwanted items that you don’t want to bring to your new home or items you haven’t used in years! With a Bin There Dump That dumpster rental gently placed in your driveway, you can easily throw out things you no longer need. That way you can reduce the number of boxes and clutter to bring to your new home. Making your new house or apartment that much more enjoyable sooner! Here is a link to a past blog where we have links to some great Indianapolis moving companies! When you are expecting a new addition to your family, you need to buy new stuff for the baby that includes a crib, baby monitors, clothes and other things. It also means you need to make room for the new items by getting rid of the old. If it is the first child, then you also need to kid-proof your home. You will be surprised at the number of things to get in place before bringing a new born home! By renting a dumpster, all your materials are disposed of properly and discretely. Once the dumpster is full, you don’t need to worry about anything else. Your friends at Bin There Dump That will pick it up, sweep up the driveway and your home will be free of clutter and trash, its that simple! Bin There Dump That will be there when you need to get rid of a lot of stuff and there is no need to rush, do it on your schedule. The residential service period is for seven days, but you can have them pick it up sooner if needed! If one of the events listed above is in your future give Bin There Dump That a call at 317-590-1973, or log onto to their website, you will be happy you did! 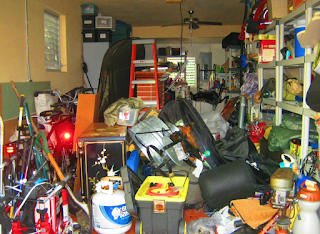 Indianapolis Garage Clean-outs: how to do it right! Are you struggling to declutter your mess? Read on to discover how a dumpster might help! Clearing out your garage might be a daunting task. Perhaps, you haven’t really done anything with your old stuff in years, and it might be quite time-consuming to go through everything and finally take back your space. Have you ever thought of renting a dumpster? They say first impressions are everything so what will your garage look like the next time your garage door opens? A dumpster rental may be just what the doctor ordered! all of this junk and clutter? - More space to do the things you actually wanted to do: A garage that’s better organized will appear a lot bigger, and you could do so much with all the space you can take back! - Frustrated of having to keep your car outside because it just won’t fit in your messy and cluttered garage? A free and tidy garage could finally be used to house your vehicle. - Less stress and more peace of mind in a tidy environment. Spending time in a messy environment is often linked to decreased productivity and stress. By removing all the clutter, you will also be able to make the most out of your garage space, particularly if you have a workstation or tool bench there! - Take back that work bench and complete your “honey dos” Your spouse will thank you for it! Clearing out your garage may seem a daunting task however when you rent a dumpster the task becomes a lot easier! You might have a busy schedule with work and other commitments getting in the way but don’t worry the dumpster rental lasts 7 days so work at your own leisure! Weekend dumpster rentals are also a great idea if you like to take advantage of Saturdays and Sundays! These are some of the many positive reasons why you should rent a dumpster in the greater Indianapolis area! Our dumpster order experts will certainly be able to guide you through the process and find the perfect size dumpster to meet your particular needs. · Get rid of the old junk you don’t want, you never know what you might find in the middle of all that mess! · Rearrange your lawn mower and snow blower, make sure you have easy access to the one you need for the upcoming season! If you have items in your garage that you may think our hazardous, check out the link below to answer your particular questions about items that aren’t permitted in a dumpster. Garage clean-outs are more than just cleaning: by renting a dumpster you will be able to dispose of junk you haven’t used in years and finally take back the valuable space! Ordering a dumpster for your garage clean out is easy. Simply give us a call at 317-590-1973 or fill out the dumpster order form on the website and we will call you! Si estás buscando un servicio de alquiler de contenedores en Indianápolis y alrededores, estás de suerte. Te queremos presentar Bin There Dump That, la empresa de contenedores que te pone las cosas fáciles. Encontrar un servicio de alquiler de contenedores de confianza no es algo sencillo en Indianápolis y alrededores. Desde la creación de Bin There Dump That, hemos querido poner a nuestros clientes en primer lugar y darles el servicio que necesitan y que se merecen. Nuestro servicio se adapta a las necesidades de todos nuestros clientes. Atendemos con las mismas ganas a profesionales y a particulares, a clientes que hacen uso de nuestros servicios una vez y a aquellos que nos llaman habitualmente, a los que necesitan un pequeño contenedor y a los que les hace falta un contenedor de gran capacidad. Por si fuera poco, nuestro servicio de alquiler de contenedores es el más rápido del mercado. Tratamos los pedidos inmediatamente de modo que nuestros clientes pueden disponer de su contenedor en el mismo día, si así lo precisan. Utilizamos camiones de una talla reducida y contenedores diseñados especialmente para poder acceder sin problemas a cualquier punto de una zona residencial, desde una pequeña entrada de vehículos hasta un estrecho callejón. Trabajamos con la máxima profesionalidad y el máximo cuidado para que ninguna zona residencial quede dañada. Al llegar, por ejemplo, colocamos siempre tableros protectores en la entrada para que el contenedor no tenga en ningún momento contacto directo con el suelo. Muchos de nuestros clientes son constructores, techadores y jardineros paisajistas que precisan alquilar contenedores en Indianápolis para la retirada y transporte de residuos procedentes de su actividad. Sin embargo, esto no ha de llevarnos a engaños. Si bien nuestro servicio de alquiler de contenedores es utilizado frecuentemente en grandes obras y reformas, puede ser usado en todo tipo de proyectos residenciales. Queremos que nuestro servicio de alquiler de contenedores sea accesible a todos los que nos puedan necesitar en Indianápolis y alrededores. Por eso, estamos encantados de atender a nuestros clientes tanto en inglés como en español. Nuestra recepcionista habla español y podrá resolver todas tus dudas o tomar nota de tu pedido en español. Sólo necesitas llamar al 317-590-1973. Deja que Bin There Dump That se convierta en tu servicio de alquiler de contenedores en Indianápolis y alrededores. ¡No lo lamentarás!